Despite tweaking his knee only days before in the semifinals match against North Florida, senior guard Lovell Cabbil was back in action, and the rest of the team was ready to play hard. Against all odds, the Flames defeated the top-seeded Lipscomb Bisons 74-68 Sunday in the Atlantic Sun tournament final. 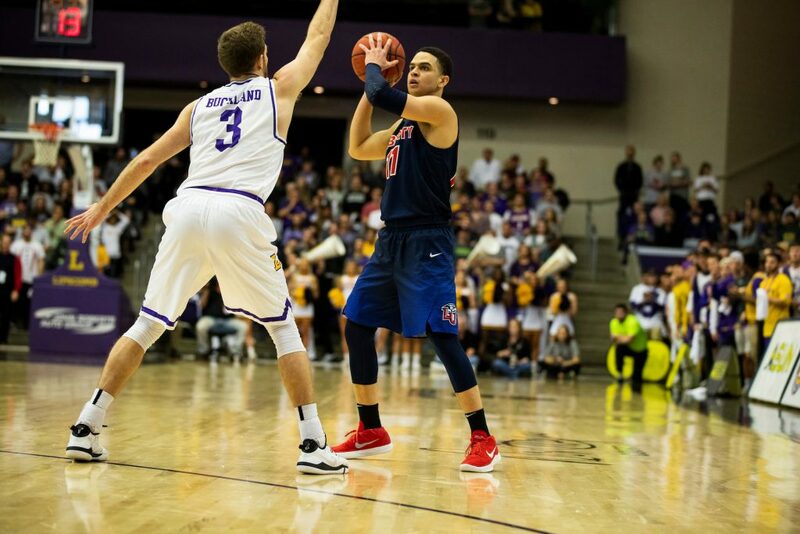 The Flames defied Lipscomb’s overwhelming home advantage and took down the Bisons for the second time this season. 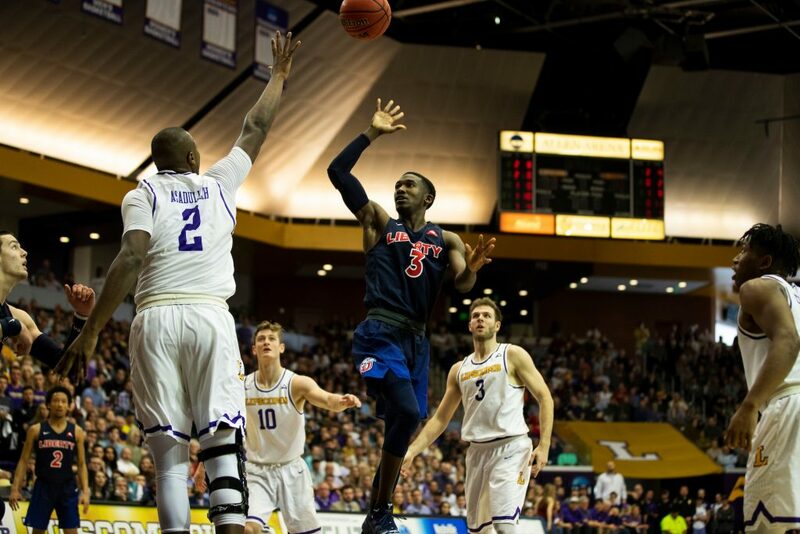 The men’s basketball team plays Lipscomb University in Allen Arena for the ASUN championship game in Nashville, Tennessee on March 10, 2019. The Flames received several honors Sunday, redshirt junior forward Scottie James being named MVP. James, Cabbil and junior guard Caleb Homesley were named to the all-conference team. “We’ve had the mentality all year that we’re confident (that we can win) every time we step on the court, regardless of who we’re playing,” Cabbil said. The Flames were led by James with 17 points and eight rebounds, followed by junior guard Georgie Pacheco-Ortiz with 16 points and Cabbil with 14. 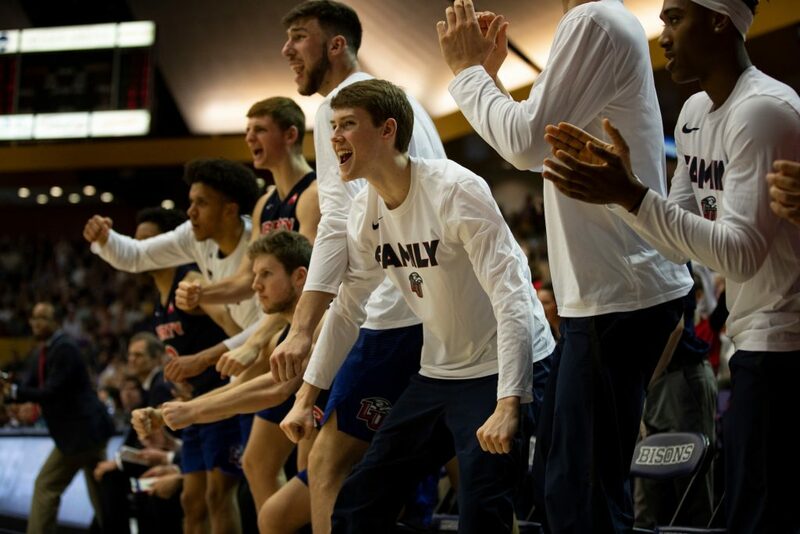 For moments in the first half, the championship game appeared as if it was going to be the same as Liberty’s first home matchup against Lipscomb when the Flames lost 79-59. Their play was, again, markedly sloppy and the tempo was badly controlled while the Bisons extended their lead to as much as eight points. Junior Georgie Pacheco-Ortiz sets up a pass. The Flames refused to be put out, and worked their way back into the game towards halftime. Liberty tore off on a 9-0 run in the last three minutes of the half, helped along by a nearly five-minute scoring drought from Lipscomb. The first half ended when Cabbil struck from outside the arc and forged a path to the basket, finally leaping for a layup with two seconds left in the half. The score at halftime was Liberty in the lead 29-28, much to Lipscomb’s frustration. The second half was a different story as both teams played their hardest for the win. Much of the half was spent in a back-and-forth battle for the lead, highlighted by 18 lead changes and five ties. Liberty’s largest lead was four points and, despite Lipscomb’s best efforts, the Flames led for 13 minutes of the half. Three Flames players shot 10 points for the half, including James, Cabbil and Pacheco-Ortiz. On the Lipscomb side of things, only guard Garrison Mathews and forward Rob Marberry entered the double digits. Senior guard Lovell Cabbil is back in action after tweaking his knee only days before in the semifinals. The game tightened up as the minutes ticked on, with neither team managing to climb beyond four points of the other before the lead would change again. 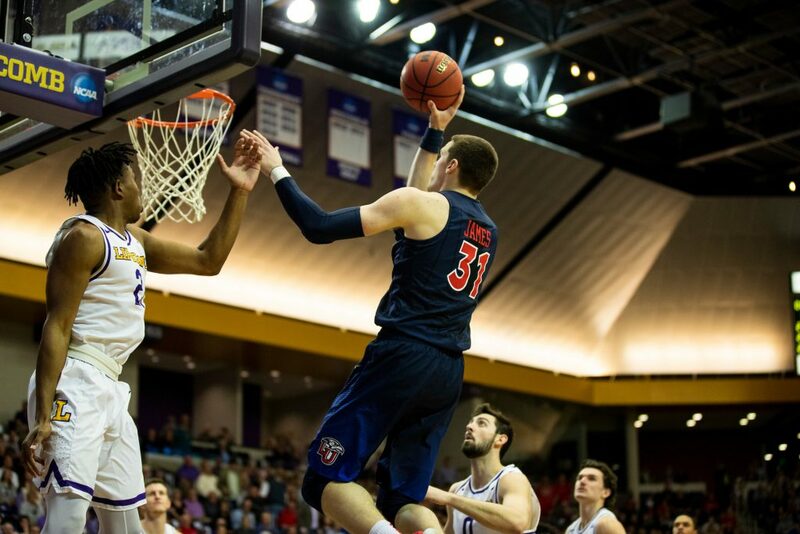 James’ determination to reach the basket proved to be too much for Lipscomb when he soared above three defenders for a layup and earned the last lead change of the game. The layup occurred with less than a minute left in the game when the Flames took over 67-66. The game screeched to a halt when Cabbil fouled Marberry with nine seconds left, sending Marberry to the line. Marberry missed his shot, which was rebounded by James. James was fouled immediately after, racking up two more points for Liberty as James sank both of his free throws. 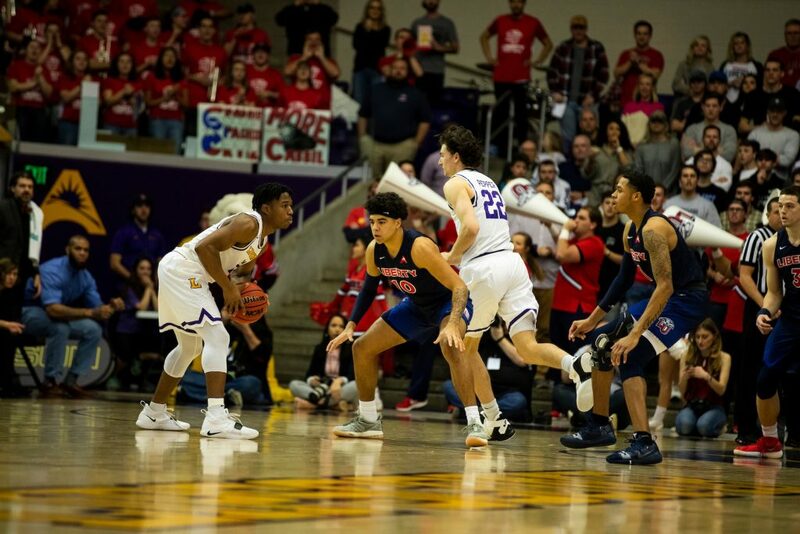 Lipscomb failed to follow through after the free throws as Marberry missed a critical three-pointer, one that would have made the game a one-point difference again. Sophomore Elijah Cuffee focuses on the court against Lipscomb Bisons. After Marberry’s missed shot, the game was over. Homesley came down with the rebound and was immediately fouled. His two free throws, shot with one second left, were the last points of the game. 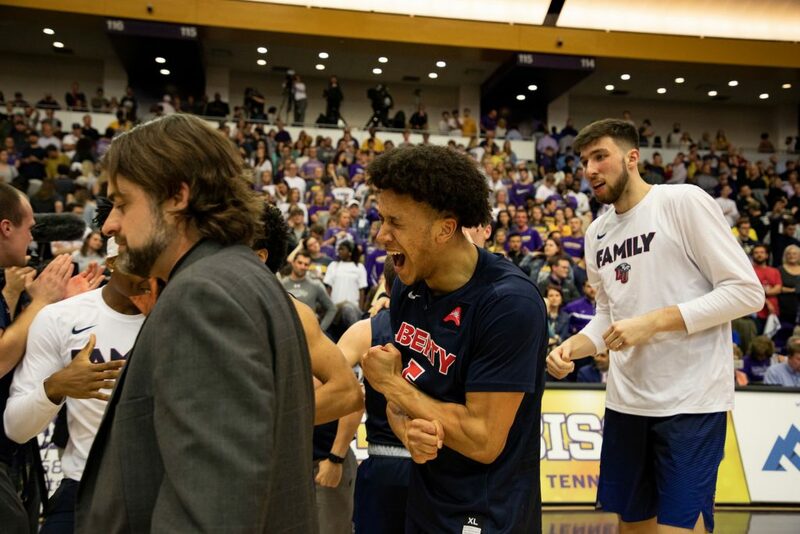 The Flames rushed the court after the clock ran out, crushing into a dogpile atop Homesley and Cabbil near half-court while the Bisons retreated to their bench. 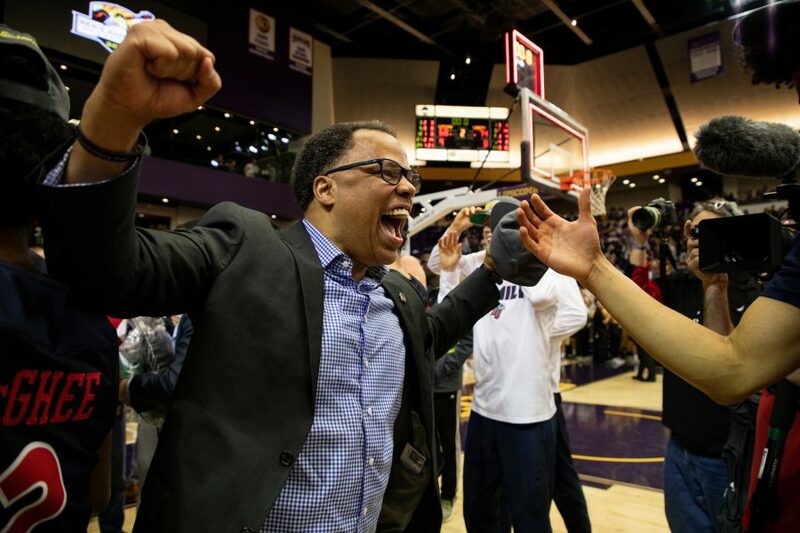 With the win, Liberty secured its first bid to the NCAA tournament since 2013. Liberty’s next opponent, game location and date will be released Sunday evening. I love that A-Sun does home sites for the tournament. Atmospheres are amazing, and the teams that performed in the regular season deserve the edge.